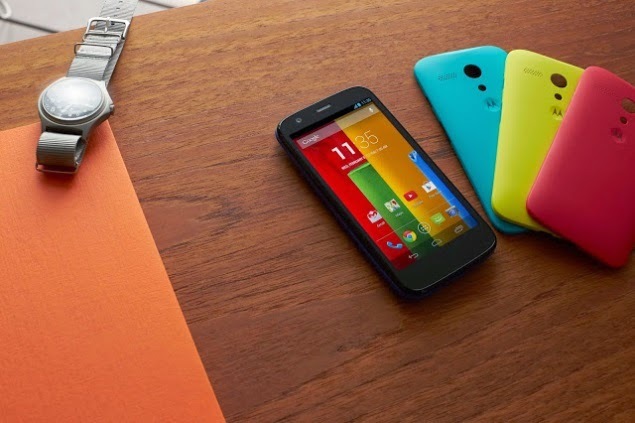 In November of 2013 I purchased a Moto G phone since my old one had tragically died by death of its power button. It was an old Nokia which I was using for over a year since I had lost my previous phone, a ZTE Blade, in a torrent whilst in a bus, don't ask, it's a story for another time. I didn't want to spend a lot of money on a phone so when I came across Moto G and read all the reviews about it, I knew it was the one for me. It was cheap but not cheaply made, it had great specifications, an even greater screen and the thing that everybody was saying was that it was the best value for money Android smartphone anyone could get. So I got it and all I had read about came out to be true. It is a phone that runs smoothly, it is fast, the vanilla Android software is perfect and it hasn't let me down until today. The only disappointing aspects of it are its pretty crappy camera and the lack of a microSD slot but I knew about those before I bought it. Today, Motorola announced some new products. Amongst them is the new Moto G with a bigger 5" screen instead of the 4.5'' of its predecessor, a better camera with 8MP and 2MP instead of 5MP and 1.2MP, front facing stereo speakers, dual SIM and a microSD slot. Putting two and two together, the conclusion is that it is a better version of the last one, although I prefer the smaller screen. So, if you are in search of a low-budget but exceptional phone in an exceptional price (their slogan is dead-on), you should buy it. Even if it is only as good as the first one, you will love it.